Concrete driveways are a more affordable alternative than asphalt. Concrete is poured at 4" thick and standard asphalt thickness is 2". There is virtually no maintenance with concrete where as asphalt has to be sealed every couple of years. Concrete is functional and naturally durable. It never needs replacement. 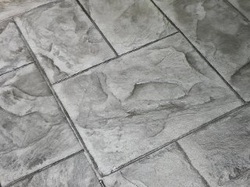 Concrete is easy to maintain and clean. Concrete is allergy friendly - does not harbor dust, dirt, pollen and other allergens, and produces no irritating fumes from glues and adhesives. Concrete is a "green building" material, using some of the earth's most common and abundant minerals for its raw materials.. Concrete is made from natural, earthy elements rendering each flooring or countertop design uniquely original. easy adaptability to any setting.